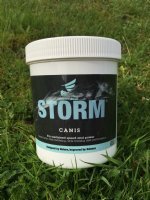 STORM Canis - CSJK9 Ltd.
STORM ® Canis is a totally natural feed supplement that can help all working and sporting dogs work at optimal speed and power for longer. By encouraging fast bursts of speed and quick recovery times, STORM® Canis actively promotes a dog's health and well being. It should be added to the normal diet, thus providing part of a normal balanced ration. STORM® Canis is a totally natural feed supplement that can help all working and sporting dogs work at optimal speed and power for longer. By encouraging fast bursts of speed and quick recovery times, STORM® Canis actively promotes a dog's health and well being. It should be added to the normal diet, thus providing part of a normal balanced ration.